Three boats carrying migrants across the Mediterranean have been shipwrecked in recent days, with 700 people presumed dead. The few survivors of the worst incident told police that when those on board objected to being transfered to a second boat which looked even less seaworthy than the first, smugglers responded by ramming the boat, sabotaging the journey. While an investigation from both police and the International Organisation for Migration must certainly take place, it is not enough to simply reduce these incidents to crimes. 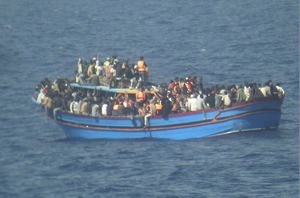 „Many factors feed into boat migration,“ writes Judith Sunderland at Human Rights Watch. „… fear of persecution in Eritrea, dying under bombs in Syria and Gaza, drought and lawlessness in Somalia, poverty and conflict in South Sudan, and similar causes in scores of other places. The first she names is that the EU must create safer legal ways for asylum seekers to reach Europe – by seeking protection through official means rather than attempting dangerous sea crossings.